The Intelsat IV series of communications satellites, launched from Cape Canaveral during the early 1970's, marked the fifth generation of geostationary communications satellites developed by Hughes Aircraft Company since the 1963 launching of Syncom II, the world's first synchronous satellite. Syncom II, 15 inches high and 28 inches in diameter, weighed 78 pounds in orbit. 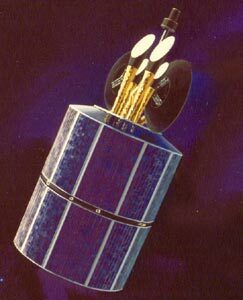 In contrast, the Intelsat IVs weighed over 1300 pounds (595 kg) in orbit and were more than 17 feet (5.31 meters) in diameter. Launch vehicles for the satellites were the Atlas-Centaur rockets. Eight flight spacecraft and one prototype were built for the International Telecommunications Satellite Organization (INTELSAT). Communications Satellite Corporation (COMSAT) managed the Intelsat IV program for the then 109-nation organization. Seven of the huge satellites were successfully launched between January 1971 and May 1975. Companies from 10 nations representing Europe, Japan, and Canada participated with Hughes in building the satellites. Each Intelsat IV satellite could relay 6000 two-way telephone calls or transmit 12 simultaneous color television programs or varied combinations of communications traffic, including data and facsimile. The communications subsystem consisted of global receive and both global and spot beam transmit antennas connected to a microwave 12-channel repeater that provided high power amplification for each channel. Six antennas -- two global receive, two global transmit, and two spot beam transmit -- were provided. The spot beam feed horns illuminated the parabolic reflectors, which focused and redirected the energy toward earth. Each spot beam antenna was individually steerable, and its beam center could be pointed anywhere over the visible portion of the earth in incremental steps of less than 0.01 degrees. The satellite had 12 broadband communications channels. Each channel had a bandwidth of 40 MHz and provided about 500 communications circuits. Four of the repeaters were dedicated to earth coverage antennas, and eight could be switched to either earth coverage or spot beam transmit antennas. All seven spacecraft exceeded their design lives and have been retired from active service, the last of which, Intelsat IV F-1 was retired in October 1987.